Good morning. This week I used up some more leftover fabric that’s been hanging around for a while. It's lucky that I love A-line skirts, as most of my leftover pieces only seem to be A-line skirt-sized. I used the same vintage pattern as my last A-line made from leftovers (McCall’s 7978) and it was just as foolproof to make second time around. The fabric was leftover from my Crepe dress which is SSOOO pretty, and I underlined it with plain white muslin. This time I had enough to give the skirt its very own waistband - a luxury the last one sadly missed out on. I wanted to fiddle around with a fancy trim on the hem again, but the only trim I had in my stash that was the right colour was crossgrain ribbon. Karen from Did you Make That? first got me interested in ribbon as a skirt trimming when she added one as a facing on this skirt. Gorgeous isn’t it? I’m definitely going to add one to the waistband of my next A-line. For now, I just added it to the bottom hem as a contrasting touch. Yet another one for my Me-Made-June wardrobe – hoorah. It also feels nice and virtuous using leftover fabric and relieves me slightly (only slightly, mind you) of the guilt/horror of wasting £18 on the lining that shall remain nameless. Grrr. I’ve got a craft show right after half term, which I’ve been working hard at getting things ready for. Once that’s finished I’ll take another look at my Oolong….. It was such a delight to make, I made another one straight away! I’ve just started work on the Colette Pattern Oolong dress as a back up dress for my brother’s wedding (in case it’s too hot for my wool crepe swing dress). There are hardly any versions of this pattern out there - I wonder why this is? It’s such a flattering looking dress AND has no buttons or zips (always a big plus in my book), but still it’s thin on the ground. The two nicest versions I’ve seen have been this gorgeous red number by Isaspacey and Amanda’s pretty flowery version. In fact it was Amanda’s version which inspired me to try out the pattern. The pattern arrived and I cast my eye over the cutting layout…. ... no words needed, just a deep breath. 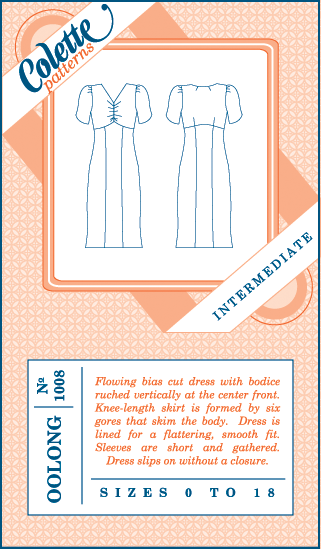 The entire dress and the entire separate lining is cut on the bias from a single layer of fabric, no folding. I almost backed out there and then, but something about the dress was calling me. The Oolong has a 1940’s look about it with the gathered sleeves and the cut under the bust - so a vintage-y looking fabric was called for. I settled on this cotton lawn, if the weather does turn out sunny then it should be lovely and cool. As it’s a wedding, I wanted a bit of luxury so I decided on a silk lining which I picked up at last week’s Goldhawk Road Fabric Fandango. And that, my friends, was my fatal error. Without doubt, this fabric has been the absolute worst I’ve ever sewn with. Bar none. I took Isaspacey’s advice and decided to use the lining as a muslin to check any fitting issues. It took ages to cut out and just wouldn’t behave itself. However much I weighed it down and held it still, as soon as I’d cut each piece out it immediately changed shape. I then had to let the pieces hang for 24 hours, then press and stretch each one before the sewing machine even saw the light of day. Tedious and tiresome. And the icing on the cake? I cut a size too small. Grrr. I had enough fabric left to cut out another bodice in the next size up and thankfully, this was a good fit. So, I sewed the skirt section up and tried it on. Disaster. Yes, it also could have done with being the next size up but that wasn’t the problem, it was the feel of the lining fabric that was just dreadful. It was so static and absolutely clung to me, I felt like I’d been wrapped in cling film. The pictures on the dummy are pretty accurate of how the dress looked on me size-wise but NOT a true representation of what it looked like on me cling-wise! BUT, through the darkness I can still see that the dress is perfect for the curvy figure - even resembling sausage meat forced into a skin it was extremely flattering. I’m going to continue making the dress, but I’ve obviously made an error with my choice of lining (a BIG error, I'm definitely out of pocket). After a lot of pondering and dreams about it, I’ve decided that the best lining for a bias cut dress made from cotton lawn is more cotton lawn. I like the idea of a traditional lining fabric, but can’t bear the thought of it clinging to me like a limpet. I'm hoping that cotton on cotton won’t have any clinging issues and will give a nice, smooth finish. Wow, what a fantastic time we had on Saturday at the Goldhawk Road Fabric Fandango (read Karen’s and Tilly’s posts for much better descriptions/pictures than I could ever do). As I live quite locally I restrained myself on the fabric buying front and just bought some silk lining for my forthcoming Oolong dress plus a funny little strawberry print which I’ll probably make into a bag. But fabric buying wasn't the reason I went along, I went for the once in a blue moon opportunity of meeting all my favourite bloggers in one place. And boy did they not disappoint! I got to meet some of the nicest and most talented people ever - it really was an absolute pleasure. And we talked about fabric non-stop all afternoon. What more could you ask for really? It was a great day which I’ll remember fondly for quite some time to come. Thank you so much Karen for making it happen. In other news, I recently had a re-order from the lady mentioned here for more of the zipped purses I made for her, yippee. Along with fabric combinations I know sell well at craft fairs, I added in a few new ones from recent fabric splurges. I’ve used this combination before in a bag so thought I’d give it a go as a make-up bag. These are a few fat quarters I picked up in M is For Make’s recent sale..
I’ve used this combination before too but not at a craft fair. I sent a similar one to Karen from Did you Make That? as a thank you for a very kind favour she did for my son. It went down very well, so I’ve added it to my list! And finally, some of my very kind friends clubbed together and bought me Liberty vouchers for my birthday. The vouchers were burning a huge hole in my pocket, so as soon as I had a free day I hot-footed it into town to spend them. Choosing a favourite Liberty print is a bit like asking you to choose your favourite child (well, not quite but it’s pretty difficult!) But when I saw this particular print I immediately fell for it. With the unseasonably good weather we’ve been enjoying recently, I thought I’d better get cracking on a few more summer tops for Me-Made-June. I hadn’t got round to sewing this 1950’s Simplicity pattern before as it’s for a 34 inch bust and I thought it would be too small. I've been trying to work up the energy to try a full bust adjustment. Then I read this post by Gina on her blog Vintage Girl, in which she recommends choosing a pattern based on your high bust measurement rather than your full bust measurement for a more accurate fit. Apparently, this is a good way to buy a pattern if you’re a C cup or above, which I am. I usually cut a size 36 bust, as that’s what my bust measures, but I do have problems with back width and general bagginess. My high bust is 34, so as an experiment, I thought I’d sew up the 34 inch pattern and see how I fared. As my test fabric I used some £2 a metre navy gingham from Shepherd’s Bush market. I LOVE gingham and always have. Here I am on holiday in Italy aged five, rocking the gingham look! And here’s one of my mum and her friends from the same holiday looking ridiculously 1970’s! It’s nothing whatsoever to do with sewing, but I couldn’t resist, look at her outfit! So, back to the blouse… I secretly hoped the test blouse would fit so I could prance around in something gingham. And guess what? It does! It’s a really good fit across the bust …. No back narrowing adjustment needed. Thank you Gina for a really useful post. The pattern has some lovely details, dart tucks at the front and back plus neck darts. It’s also naturally longer than a lot of 1950’s patterns, which often tend to be on the short side. I’ll admit that attaching the collar and facing was an absolute bugger for me to get my head round. I finally figured it out, but there was a fair bit of unpicking to do before it all made sense. Apart from that, it was a nice, easy pattern. I’ll almost certainly use it again to make a second version. Looks nice with red too. I do feel a bit like Ellie May Clampett from the Beverley Hillbillies in it but that’s no bad thing. Being navy based, it will match lots of my wardrobe, so I’m sure it will get lots of wear. Next up, something in polka dots I think…. 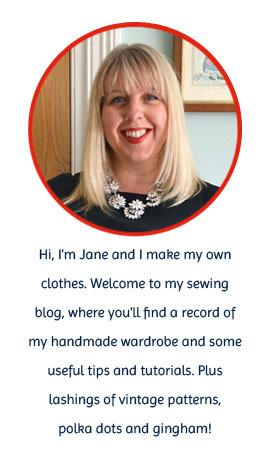 I, Jane of handmadejane.blogspot.com, sign up as a participant of Me-Made-June ’11. I endeavour to wear at least one handmade item each day for the duration of June 2011. Actually I’m really looking forward to my first Me-Made challenge. I’ve just about got enough me-made items to see me through a whole month and the fact that it’s happening in June is a big bonus, as most of my handmade clothes tend to be on the summery side. There are a few gaps, which I’d better try to fill before June. Yikes! Anybody else taking the challenge? Number five comment - Lisa!!!!!!!!! Lisa has a great blog called Lisa Sews and has made some really lovely things. She couldn't decide between the Beignet skirt or the Violet blouse on her comment, so it's decision time! Lisa, e-mail me when you've decided and I'll sort out your prize. Being naturally nosy, it was fascinating to read which pattern each of you would choose. For anybody who's interested, the next Colette pattern on my sewing list is the Oolong dress, which I'm hoping to make in the next few weeks. Thanks again everybody for entering the giveaway, and especial thanks to Kate at M is for Make for so generously supplying the winning pattern.